It’s been a while since my last update*. Suffice to say I got ill and everything went a little out of control. I think it would be quite easy to mistake our polytunnel for a jungle at the moment! I need to get better at juggling illness and smallholding, maybe juggling babies and smallholding as well. On a more positive note we have some new additions. Meet Baldrick and Barbara. 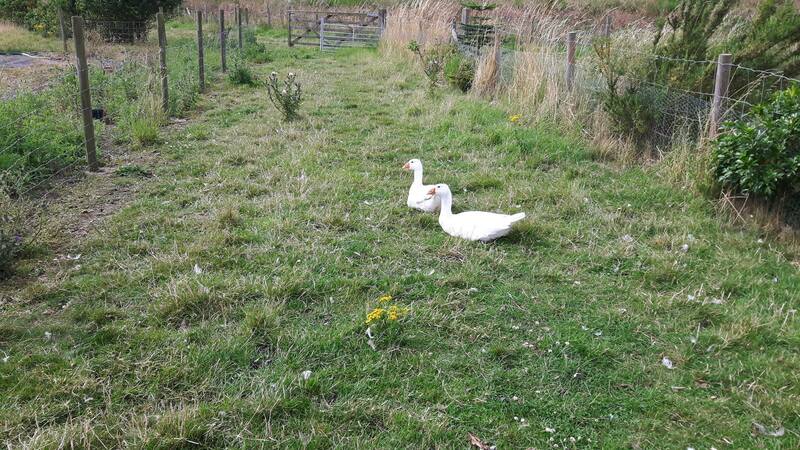 They are two Embden geese, born mid May and hopefully one male and one female. I’m actually feeling pretty confident that Baldrick is a boy, his croak is harsher than Barbara’s. There’s also the grey feathers on the wing of Barbara, this is mentioned in the breed description as being possible in females in their first year. For the most part they have settled in well, although Baldrick quickly took the title of stupidest animal at Six Oaks. Within 10 minutes of being here he had gotten his head stuck in the fence somehow. Then he tripped over the goose bath, going face first into it. Within his first week he had also gotten into a fight with one of our sheep. Our plan for these two is to send Baldrick off as a meat goose, see how we find the process and meat as a test for doing it on a larger scale. Barbara is going to join Athos’ harem and hopefully provide some nice Toulouse x Embden chicks for us to eat and sell as meat. 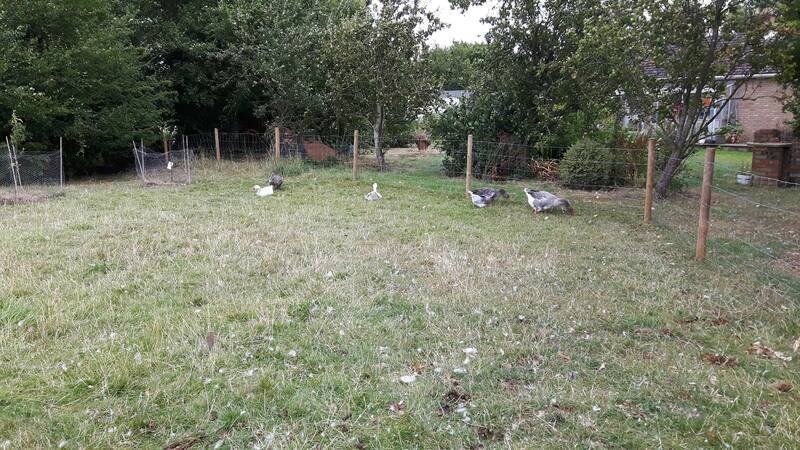 We had intended on keeping the two groups of geese separate for a while but in the time it took for Sam to get Baldrick to the goose area Barbara had broken out into the existing geese’s area. We just let them mingle after that. There have been a couple minor squabbles. Mainly when food is involved but for the most part they are happily co-existing, although not one group as of yet. 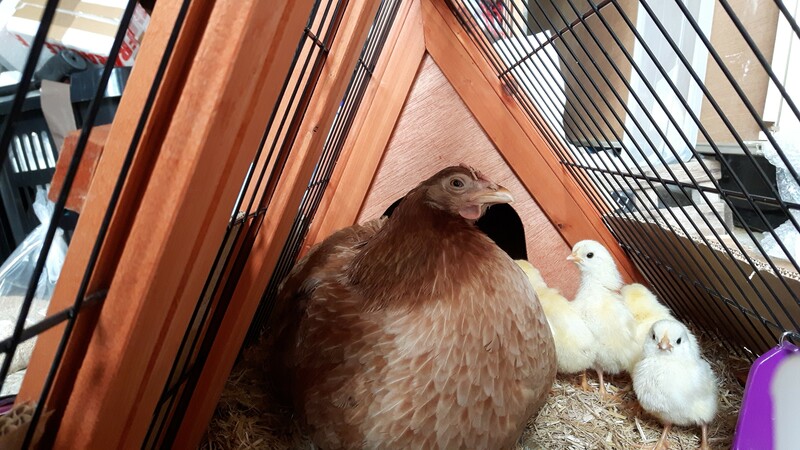 Our first batch of chicks are doing well, well 3/4 of them are. We found little blackie (proper name Bellatrix) dead in the garden late one afternoon. Somehow the door to the coop had come open (the latch closing it isn’t very good and has since been tightened). 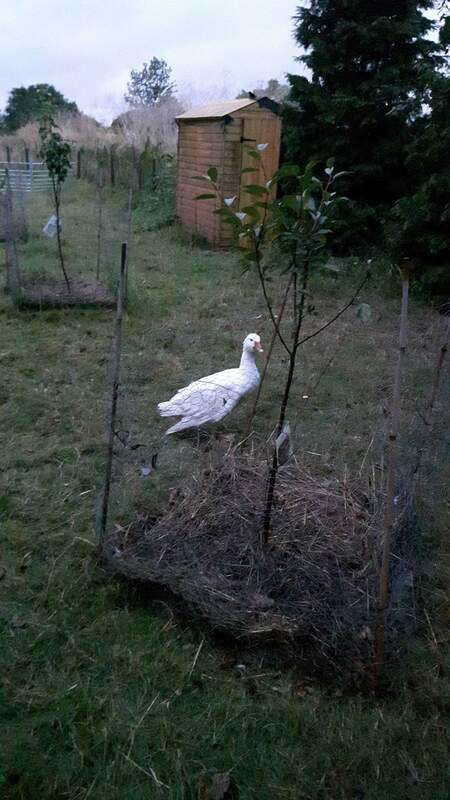 We found Aino and 3 chicks huddled under a bush and Bellatrix dead in another part of the garden. I think it was a goose as there was one wound under the wing and blood on her legs suggesting she had walked wounded. She was also very close to the goose area. It could have been a cat or another chicken though. Catching the others was not fun, and included all of them running into the goose area, but we managed it. 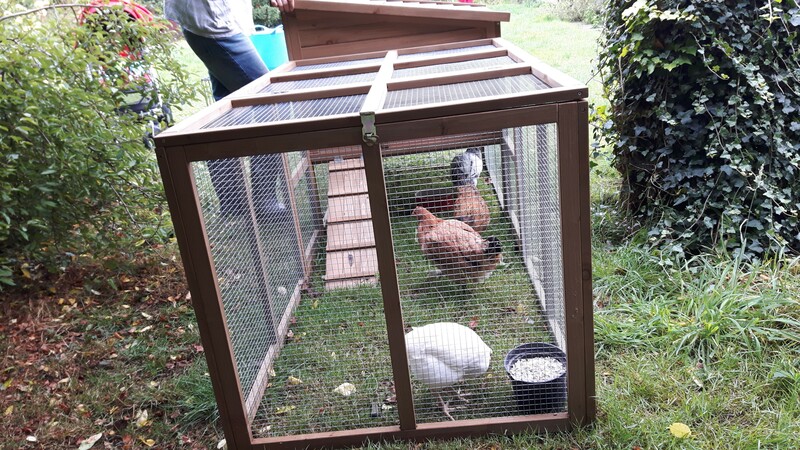 They’ve got a new coop and run on order to give them more space and keep them more secure. We had been thinking about bringing the chicks into the flock but after that we will wait until they are at POL (point of lay). Our last new additions are still in progress. Aurora went broody and in the quest for a truly multicoloured egg box we bought some White Leghorn eggs to go under her. We are at day 21 now and we have at least one chick hatched, possibly two. Aurora has been a different broody to Aino. For one her poos don’t smell half as bad as Aino’s, but on the downside she insists on pooping in the nest and is quite caked. We tried cutting the offending feathers off but it is all quite close to the skin. We’ll have to bath her once the chicks are hatched. She got very distressed at the trim we gave her and hatching day was around the corner so I didn’t want to spook her. The hatch hasn’t been without issues as well. 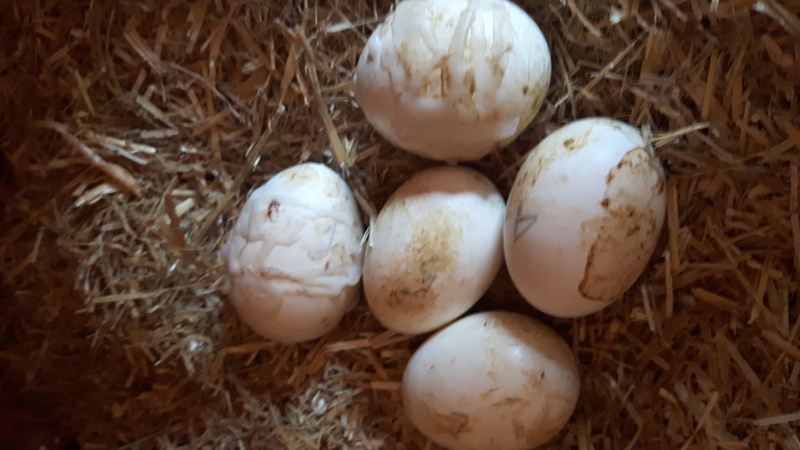 We had one infertile egg that we got rid of at day 18, not too bad out of six eggs. The biggest issue was born out of my stupidity though. Upon realising that Aurora has poop on her I decided to clean her off. Of course I wanted to stop her going back to the eggs so I blocked off the nest box before picking her up. Unfortunately I grabbed the coop door rather than the bit of cardboard I usually use. As soon as my hand moved away from it it fell and landed on two eggs. Cracked and bleeding. I was a mess. Ended up taking them inside, accepting that we had lost them and sitting down to feed Chi and take my mind off it. Sam had asked if they could still survive and I said of course not; cracked shell and bleeding – they couldn’t possibly. I googled out of interest and saw something about candle wax. Rushed to the kitchen got Sam and we got to work. They were severely cracked so a lot of wax was needed but we got them sealed up and put them under Aurora. Candled that evening and both were very much alive. Keeping everything crossed that they hatch! That’s it for new additions for now, although we are in talks to get a ram lamb to come and service our girls, stay over winter and then fill our freezer in spring. Hopefully more on that soon! * I actually wrote this post a month ago and it has taken me this long to get the pictures sorted out. I decided to post it as it was rather than update it. Two important updates should be mentioned though. 1) Aurora’s chicks hatched. 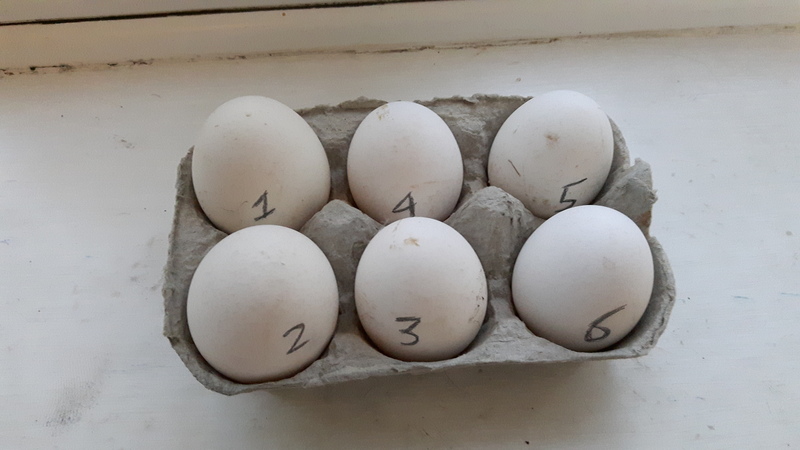 We had 4 chicks hatch, which included one of my repaired eggs, so the method works! They are getting big now and I think we have 2 girls and 2 boys based on comb size. 2) We lost Baldrick. He went downhill rapidly, from looking a little depressed on a Saturday evening to being at death’s door on Sunday afternoon. In that time we had got him to a vet but they said there was little that could be done. He had a lot of lice which were jumping ship, he was thin and very watery diarrhoea. He had looked ok to me on Friday but I guess that shows I didn’t know what I was looking for. We have since treated the others for lice and worms and are giving extra feed to help plug any gap the grass isn’t covering. We’ll be rotating their grazing more as well. It was bad husbandry that caused us to lose Baldrick, some say that it is hard to tell with birds and most new keepers get losses this way, but we will learn from our mistake and I hope not to lose another bird to something so easily avoidable.